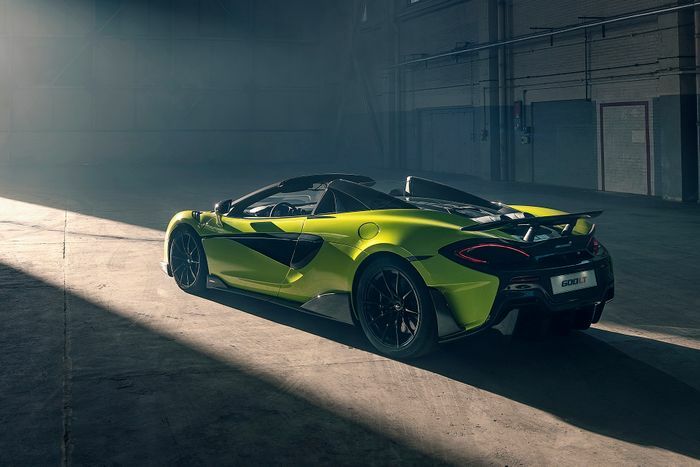 This is the McLaren 600LT Spider. We knew it was coming, but that doesn’t mean we’re not still a bit excited about the figures that have finally been released. 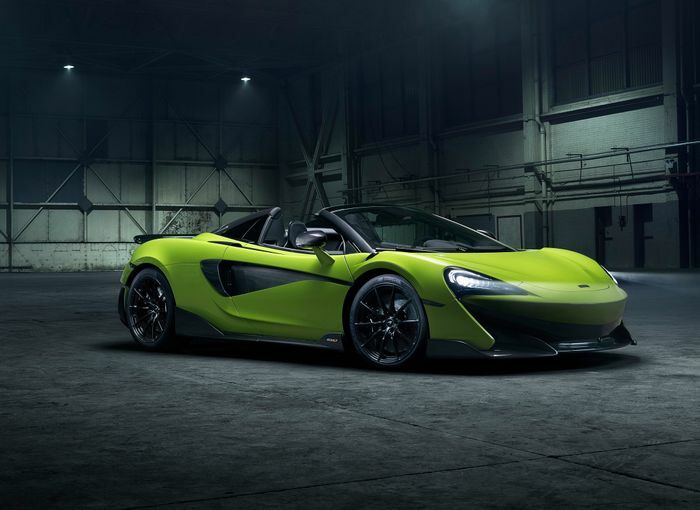 The 201mph convertible shares the same basic makeup as the 600LT upon which it’s based. That means 592bhp and 457lb ft fired furiously at the back wheels from a 3.8-litre twin-turbo V8, and a launch from 0-62mph in a sportsbike-fast 2.9 seconds – the same as the coupe. It’s a white lie to call it a 201mph cabrio because, with the roof down, the extra drag robs it of 5mph. Ah well. At least there’s no additional structural bracing required for the roof chop: as with all Sports and Super Series McLarens, the carbon MonoCell II chassis is not built to need a roof in the first place. 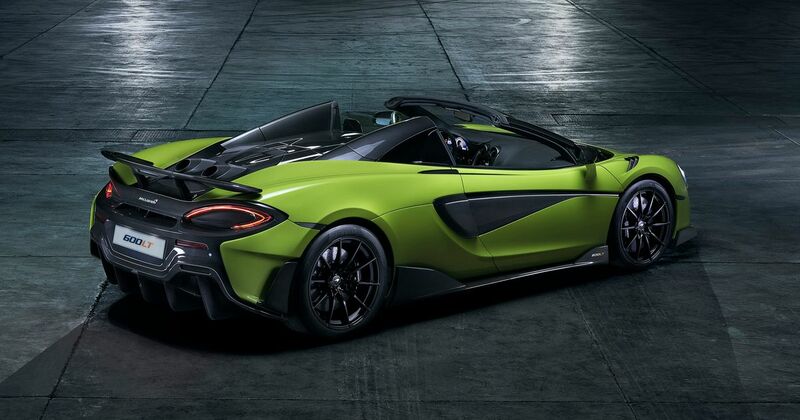 The folding hard-top roof and motor mechanisms, operable up to 25mph, add 50kg for a total ‘lightest dry weight’ of 1297kg – 80kg less than the lightest direct competitor, says McLaren. It slows the Spider by 0.2 seconds in the 0-124mph sprint versus the coupe (8.4sec vs 8.2), but let’s be honest, here: if you’re behind the wheel you’ll neither notice nor care. McLaren has managed to retain the awesome top-exit exhausts for the 600LT, as we saw last week. All that incredible theatre will be exploding just a few feet away from your ears, with potentially nothing in the way, if you lower the wind deflector. Remember, the 600LT boasts Ignition Cut in Sport driving mode to deliberately deliver a spectacular crack on full-bore upshifts. That’s on top of the fact it sounds pretty excellent already. The Spider has the same fixed rear wing as the coupe, generates the same amount of downforce and uses the same seven-speed, dual-clutch Seamless Shift Gearbox. Its dampers have been revised to account for the extra weight high up on the car. Track-focused Pirelli P-Zero Trofeo R tyres do the grippy stuff. Carbonfibre racing seats are standard but several weight-reducing options are on the list. 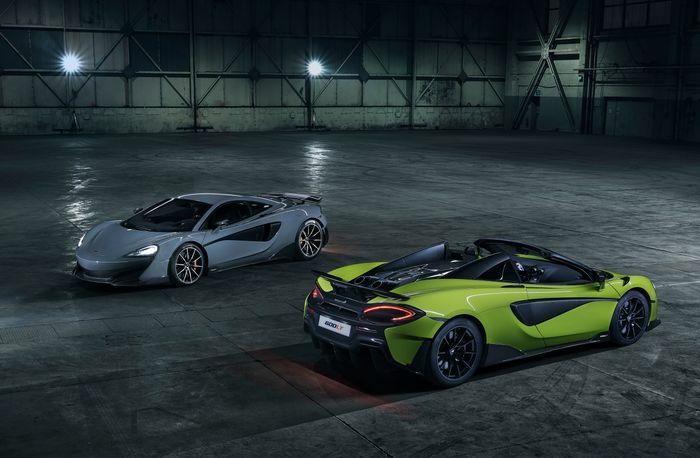 The super-light alternatives from the Senna are options alongside the option to delete the audio and climate control systems. That all seems a bit glib in a convertible, but hey, we can’t afford one anyway. Production will be limited but to how many McLaren isn’t yet saying. Build slots are available around the firm’s current workload and the number sold is likely to rest on a set time frame. The coupe was built for a single year. Prices start at £201,500 for the new Spider, including UK taxes, but excluding options.